Vibrating wire sensors are widely used in geotechnical monitoring, especially for applications where sensors are installed in the ground or embedded in concrete. They are also used in surface applications where their physical robustness is an advantage. 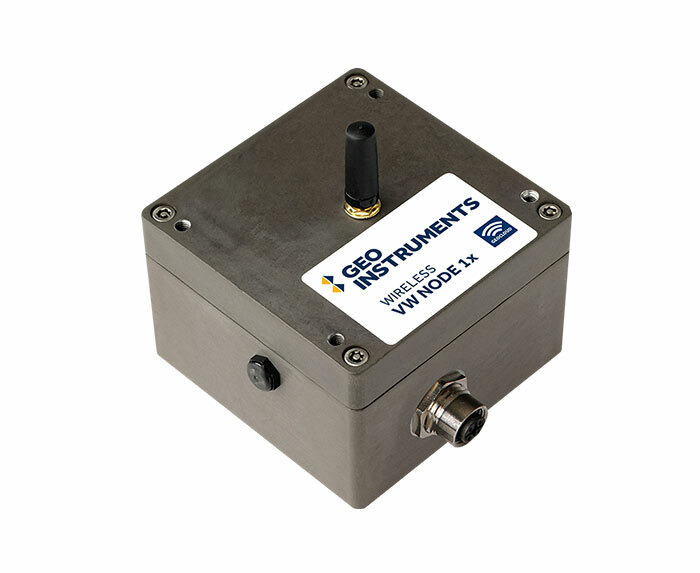 GeoCloud Vibrating Wire Nodes obtain measurements from vibrating wire sensors, digitize them, and then transmit them via a cellular gateway to GeoCloud servers for processing and presentation. 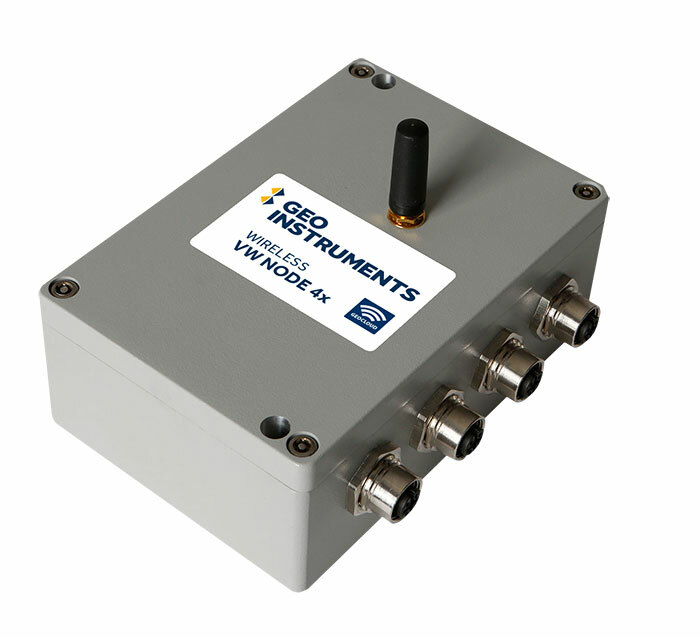 Cable-Free: VW Nodes provide their own power and transmit measurements by radio, entirely eliminating the cost of running cables to a central datalogger. Self-Configuring Communications: GeoCloud nodes optimize communication paths to the gateway automatically. This greatly improves reliability and power consumption when line of sight is not available or is blocked temporarily. Capacity: 1 VW sensor with thermistor. Battery Life: 19000 mAh battery provides 12-15 years with 20 to 30 minute reporting intervals. Capacity: 4 VW sensors with thermistors. Battery Life: 34400 mAh battery provides 12-15 years with 20 to 30 minute reporting intervals. Dimensions: 3.5 x 5.4 x 2 inches. Sensor Type: Vibrating wire, 200 to 6500 Hz. Excitation: Swept sine wave, 6V peak to peak. Temperature Range: -40 to +85°C. Connectors: Sensor cable requires M12 female screw-in connector. Operating Temperatures: -40°C to +85°C. Protocol: Proprietary Senceive FlatMesh network protocol, IEEE802.15.4 compliant.